Stir Fry is one of those meals we make a lot at home. It is fast food, easy to make and satisying. This one, made on Eat Well for Less uses frying steak which is quick to cook due to it’s thinness and cheaper than other cuts. Top tip – you don’t want to overcook this so having all your ingredients pre chopped and ready for action is a good idea. This is one of those recipes you can make your own. Adding bamboo shoots and beansprouts would give it a nice Chinese style touch, or add any other veggies you have. Use gluten free soy sauce and stock cube to make this a gluten free meal. Red meat is important for iron and zinc intake, something that we know is an issue for teenage girls and young women. This can then be exacerbated if you become pregnant. So whilst red meat is sometimes frowned upon, this recipe provides a great way to include it in your weeks meal plan. I’ve modified it from the version on the show, scaling it down to serve 4 people rather than 6. Rinse and drain the rice. Bring a large saucepan of water to the boil, add the basmati, stir well then cook according to the packet instructions. Heat a wok over a high heat until hot, add half the oil and when it’s just smoking, add the beef. Sprinkle with cornflour and stir-fry until browned all over. Remove from the pan and set aside. 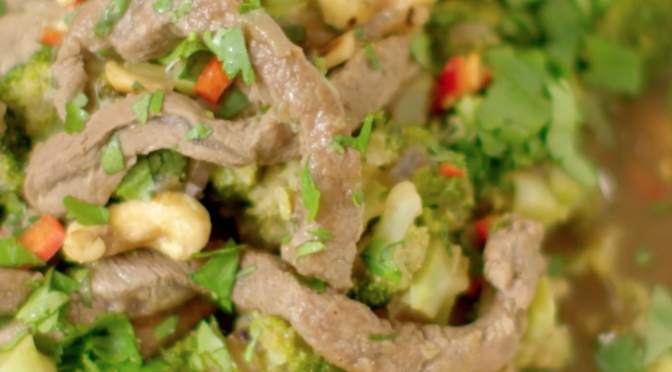 Stir-fry the cashews until just golden-brown then set aside with the beef. Half fill the kettle and bring to the boil. Add the broccoli, soy and oyster sauce to the wok and mix well. Add the vegetable stock cube with 400ml/14fl oz boiling water and bring to the boil, stirring well. Cover with a lid (use kitchen foil if you don't have a suitable pan lid) and cook for 2 minutes or until the broccoli is just tender (you don’t want to lose the bright green colour). Add in beansprouts, bamboo shoots if wanted at this stage. 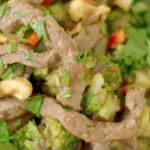 Stir the cooked beef and cashews through the sauce and heat for a minute. Scatter over the coriander and serve immediately with the cooked, drained rice.